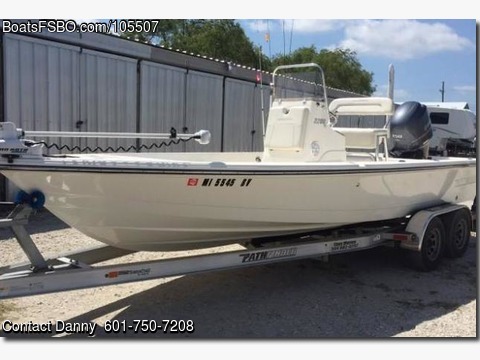 Boat is located in Chalmette,LA.Please contact the owner @ 601-750-seven two zero eight...Excellent condition, With Yamaha 150 Four Stroke with only 235 hours. AmeriTrailer with recently installled new brakes, tires and hydraulics. Excellent maintenance history with recent annual service. Comes with Garmin Echo Map 70, removable Minn Kota ST 24V-i-pilot, Sony stereo and speakers, Standard Horizon VHF, 10 ft.
Sig. series Power Pole, Three Bank on-board charger, Custom Sun/Rain covers for boat and center console. Stored in covered garage, with full, customized boat cover since new. Purchased in 2014 new with Yamaha warranty until April 2019.